Each month, Gas Compression Magazine is delivered to more than 13,000 global readers. 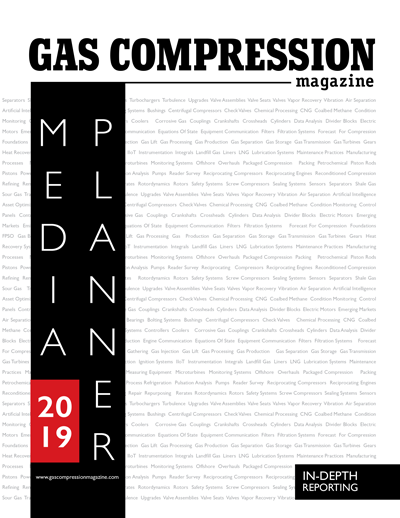 Available in print and digital formats, Gas Compression Magazine provides in-depth reporting on the products, systems, technologies, and news that impact the global gas compression market. Advertising in Gas Compression Magazine and its associate newsletter and website is an effective way to reach the people who purchase, package, maintain, manufacture, and teach gas compression equipment and systems. Download our 2019 Media Planner here. Gas Compression Magazine en Español is the ONLY Spanish-language magazine devoted to gas compression products, systems, technologies, and news. Download the Gas Compression Magazine en Español media planner here.